The Longji Rice Terraces (Dragon's Backbone Rice Terraces) covers an area of 66 square kilometers (about 16308 acres) and spans an altitude between 300 meters (about 984 feet) and 1100 meters (about 3608 feet). It is said, 'Where there is soil, there is a terrace', be it in the valley, with swift flowing river to the mountains summit with its swirling cloud cover, or from bordering verdant forest to the cliff walls. 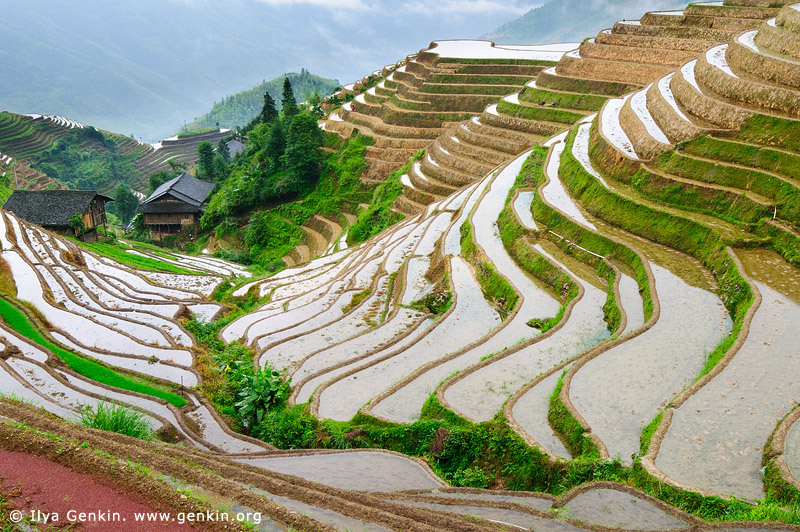 This image id CHINA-LONGSHENG-0012 of Longji Rice Terrace Fields, is copyrighted © by Ilya Genkin. This is not a public domain image.